Every day, I’m constantly inspired by our arthritis community, made up of people who are brave, funny, brilliant, insightful, industrious, and so many other wonderful qualities. People trying to be all that they can be, while also trying to kick arthritis to the curb. ACE surveyed its members to tell us about their own experiences with arthritis health care, what they would ideally expect from the health care system, and about their own disease experiences. Read the survey results and learn how to get the most from the health care system in Getting “Patient Satisfaction” from Arthritis Health Care: What you told ACE. ACE operates the Biosim•Exchange - Canada’s first and only patient led website dedicated to providing research-based information on biosimilar safety and effectiveness to inform consumers and patients and report on public and private health insurance formulary policy or listing decisions. 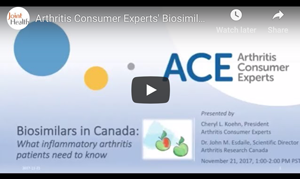 As part of its biosimilars education efforts, ACE participated in the "Biosimilars in Canada: What inflammatory arthritis patients need to know” webinar featuring Dr. John Esdaile, Scientific Director of Arthritis Research Canada, and Ms. Cheryl Koehn, Founder and President of Arthritis Consumer Experts. The webinar covered the latest information on biosimilar research and public drug plan reimbursement policy development. Read more about biosimilars. The Arthritis Broadcast Network #CRArthritis Facebook and Twitter Live event at the Canadian Rheumatology Association (CRA) Annual Scientific Meeting and Arthritis Health Professions Association (AHPA) Annual Meeting conducted a total of 39 interviews and currently informed and educated more than 94,205 people. 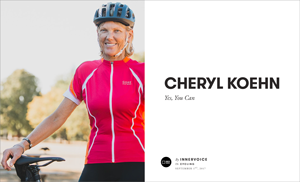 In March, Innervoice.life featured an article with Cheryl Koehn on her journey with rheumatoid arthritis and achieving personal goals despite living with rheumatoid arthritis for 30 years. Click here to read more (in English only). 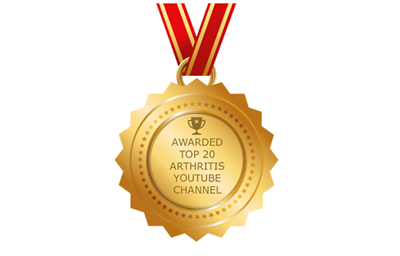 Arthritis Broadcast Network – powered by Arthritis Consumer Experts – has been ranked #5 on the top 20 arthritis YouTube channels by Feedspot. On Feedspot’s list, ABN has the most videos and views on a Canadian channel – currently a total of 220 videos and 278,497 views! 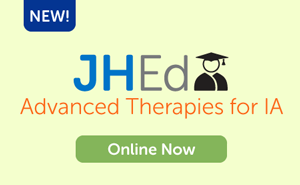 ACE’s JointHealth™ Education program is an on-demand, online, education course for people with inflammatory arthritis. In May, ACE launched its JointHealth™ Education Advanced Therapies for Inflammatory Arthritis, a three-lesson course designed to help patients living with inflammatory arthritis identify when is the appropriate time to transition from conventional synthetic disease modifying medications (csDMARDs) to an advanced therapy, such as targeted synthetic DMARD or biologic DMARD, and what key questions to ask about how they are taken and how they work in the body. Enroll now in JointHealth™ Education. In May, ACE also won first place in the World Autoimmune Arthritis Day “virtual” race (in English only) to increase public awareness of autoimmune arthritis. As part of its advocacy efforts, during every provincial election in Canada, ACE sends an open letter to political parties and individual candidates outlining the impact of arthritis and asks how government can improve prevention, treatment and care. ACE surveyed the party leaders and candidates of the 2018 Ontario Provincial Election and the 2018 Quebec Provincial Election and asked for their comments and promises on models of care, arthritis education, Aboriginal arthritis care, reimbursement for inflammatory arthritis medications, and flexible work arrangements. ACE published the party and candidate responses to help voters make their choice. Read more about arthritis issues in Ontario. 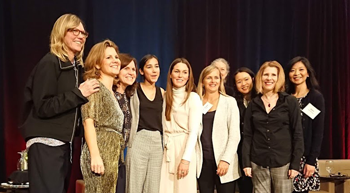 Each year, ACE holds Facebook/Twitter Live Events where ACE interviews keynote speakers, meeting attendees, and patients living with arthritis. ACE encourage the public audience to participate in the Facebook and Twitter Live events, by posting, liking, sharing or retweeting the live interviews and sending comments or questions through Facebook and Twitter during the interviews. 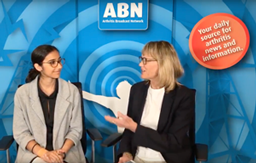 In June, Arthritis Consumer Experts also hosted on its Arthritis Broadcast Network the #Greek2Street Facebook and Twitter Live event at the KT Canada Scientific Meeting. ACE conducted 18 interviews and informed and educated more than 20,487 people on Twitter and Facebook. ACE also shared the latest research news from the June 2018 European League Against Arthritis' Annual European Congress of Rheumatology in Amsterdam, Netherlands. ACE featured an interview with the Surrey Inflammatory Arthritis (IA) Clinic on the ArthritisBC+Me website. The first of its kind in Canada, the ArthritisBC+Me website, co-founded by ACE, which also serves as Secretariat, is designed to help patients learn about arthritis and local programs best suited to their needs. Learn more about ArthritisBC+Me (in English only). ACE is a regular co-investigator, collaborator or a partner in arthritis research conducted in Canada and internationally. In August, ACE recruited participants for the OPAM-IA Study, SuPRA study, and the Centre for Hip Health & Mobility’s hip and knee replacement rehabilitation study and informed the research process from start to end. The flagships of ACE’s communications platform, JointHealth™ insight and JointHealth™ express are delivered on-line and in-print to 50,000+ ACE members and subscribers multiple times each month. They reach approximately 200,000 people through our social media channels. 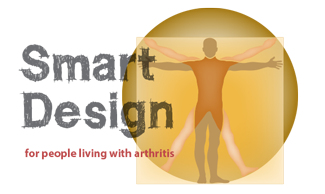 The summer edition of JointHealth™ insight focused on smart design for people living with arthritis. The issue looked at how smart choices in our living environments can make arthritis experience easier, safer, and less painful, providing solutions on how to modify home or work environments. 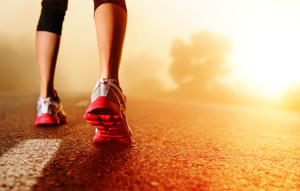 To subscribe to JointHealth™ insight and JointHealth™ express, click here. As part of ACE’s activities promoting Arthritis Awareness Month in Canada, it launched a print and social media campaign titled “Where is arthritis? – Everywhere.” In the September JointHealth™ insight and through Facebook and Twitter posts, the campaign provided evidence-based information on strategies to help change, overcome or manage the challenges arthritis patients face, including a guide to living well with osteoarthritis and back-to-school tips for students living with inflammatory arthritis. 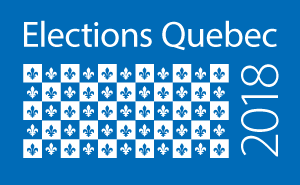 ACE surveyed the party leaders and candidates of the 2018 Quebec Provincial Election and asked for their comments and promises on models of care, arthritis education, and reimbursement for inflammatory arthritis medications. ACE published the party and candidate responses to help voters make their choice. Read more about arthritis issues in Quebec. A guide to living with osteoarthritis: Physiotherapy was created to highlight the importance of physiotherapy in osteoarthritis treatment and learn how a physiotherapist can benefit you. 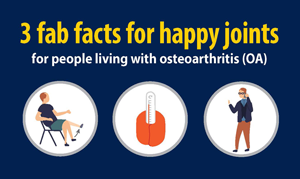 Canada’s Best Workplaces for Employees Living with Arthritis is a national campaign to help employers better understand arthritis in the workplace and recognize companies who offer exceptional work environments for their employees living with arthritis. Through a rigorous selection process using wide-ranging criteria, ACE evaluates Canadian companies that apply best arthritis practices. In October, ACE announced the 2018 winners of Canada’s Best Workplaces for Employees Living with Arthritis award: the Government of Yukon and Université de Montreal. ACE participated in this year’s American College of Rheumatology Annual Meeting by presenting abstract posters and asking our members to submit arthritis research questions using the hashtag #AskACE, which were answered by ACE’s President, Cheryl Koehn. Read more about ACE’s support and presentation of abstract posters at ACR (in English only). ACE also shared the latest research news from the American College of Rheumatology Annual Meeting: ACR News 1, ACR News 2, and ACR News 3 (in English only). 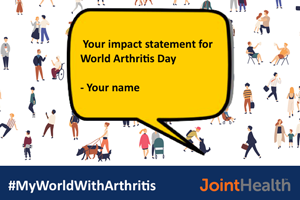 On World Arthritis Day, ACE encouraged members to share their arthritis impact statements with the hashtag #MyWorldWithArthritis. The campaign brought attention to the prevalence of the disease and the different ways that it can impact the lives of individuals and had 621,000 impressions on Twitter, with 92 participants. ACE co-presented during a Osteoarthritis Action Alliance Lunch & Learn webinar. Featuring ACE President, Cheryl Koehn and Marie Westby, Associate Member, Centre for Hip Health & Mobility on a current research study - EQUIP-ing OA Patients with Health Care Providers Through Patient Engagement in Research. Watch the webinar here. Also in November, ACE participated in the launch event of the Women in Biz Network’s nationwide series called RA Matters at Work. The Vancouver event was moderated by ACE President, Cheryl Koehn, and featured Canadian Olympic Snowboarder Spencer O’Brien, and Associate Scientific Director and Senior Research Scientist of Rheumatology Dr. Diane Lacaille from Arthritis Research Canada. 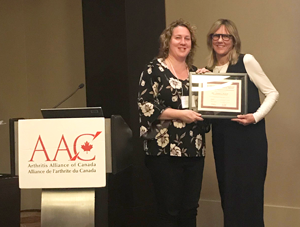 At this year’s Arthritis Alliance of Canada’s Annual Meeting, Cheryl Koehn was presented with the “Patient for Active Engagement in Arthritis Research” award. "What’s on #MyArthritisWishList?” Do you want to travel pain-free? Do you wish there were more ways to help people living with arthritis? 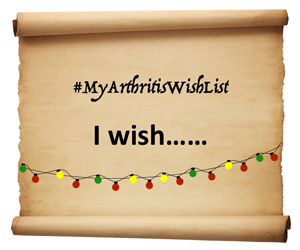 ACE encouraged members to share their arthritis wish list using the campaign hashtag #MyArthritisWishList. Read more here. 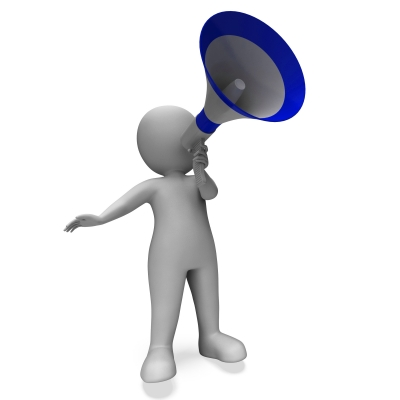 Arthritis Consumer Experts advocates for the Canadian patient community by responding to call for patient inputs. These inputs help inform policy decisions that affect the lives of Canadians living with arthritis. ACE completed eight patient inputs in 2018. Write out the tasks that need to be accomplished during the holiday season. Consider making a schedule. Categorize your list from highest to lowest priority. Try to spread out activities to save energy and consider skipping the ones of lowest priority. Shopping centres are busy in December, consider buying gifts online to save time and energy or use a door-to-door delivery service. Visit shopping centres during non-peak hours. If time permits, week days and mornings tend to be less crowded. Consider using a backpack instead of a shoulder bag so that weight can be evenly distributed. Trolleys and suitcases can also be useful for heavier and bigger items. Gift exchange with family and friends can be fun; consider doing a gift exchange where everyone brings one gift for the communal gift table. Each participant picks a gift when their name is called. A holiday party is the perfect place to showcase your fancy dress or suit and shoes, but consider bringing comfortable shoes and clothes to change into. Your family and friends are there to provide support and help. Delegate tasks, such as shopping, cooking or decorating a tree, and provide help where possible. Sharing responsibilities will help you manage pain and fatigue. Arrange to have a neighbour or friend shovel snow and salt the pathways for you. Your health and wellbeing is a top priority. During the holidays, it may feel like there is a lot of pressure to attend events and connect with family and friends. It’s alright to decline or reschedule an event. Remind your loved ones of the challenges you face. Recognize what your body’s telling you. Suggest ways that your friends can help. Over the past 12 months, ACE received grants-in-aid from: Amgen Canada, Arthritis Research Canada, Canadian Biosimilars Forum, Canadian Institutes of Health Research, Eli Lilly Canada, Hoffman-La Roche Canada Ltd., Merck Canada, Novartis, Pfizer Canada, Sandoz Canada, St. Paul’s Hospital (Vancouver), UCB Canada, and the University of British Columbia. ACE also received unsolicited donations from its community members (people with arthritis) across Canada. ACE thanks funders for their support to help the nearly 6 million Canadians living with osteoarthritis, rheumatoid arthritis, psoriatic arthritis, ankylosing spondylitis and the many other forms of the disease.